The golf ball is a product custom crafted to improve a golfer's game. Although many golfers think the clubs make the game, golf balls are a key part of a successful round of golf. The golf ball is composed of a cover and core. Golfers of skill levels are offered balls basked on type, make and compression. These balls could help you improve your handicap and enjoy your day on the links. The three types of golf balls are two-piece, multi-layered and high-performance. The two-piece golf balls have a hard cover and solid inner core. The two-piece balls are created for distance and durability. These type of balls are good for beginners as it can hold up to being hit into the trees or hazards. A multi-layered golf ball possess a liquid or solid core with a molded rubber outer core. It's cover is softer and designed for higher spin rates. The softer feel and high spin allows the intermediate golfer more control and better stopping power. These balls are more expensive and not as durable as the two-piece ball. The high-performance golf ball combines a high-spin capability and distance for the low-handicap golfer. These balls aren't durable and are quite costly. The cover of a golf ball varies and it utilized for different type of golf games. Surlyn is a hard resin that is a popular choice among the majority of golfers. It's a hard, cut-resistant covering that creates greater distance, which is more affordable for the average golfer. Balata is a rubber-like material and is softer than surlyn. Balta provides more spin and feel off of the club for the golfer. Balata is more expensive but less durable than surlyn. Elastomer is a rubber covering that provides the combination of surlyn and balata, offering spin and durability. This type of ball is designed more for the low-handicap golfer as it's harder to control in lieu of its composite designed for high spin and added power. Golf ball compression is usually broken into three numbers: 80, 90 and 100. These numbers represent the amount of compression of a golf ball. Eighty is the lowest compression that possesses a soft core for a spring-like effect that improves distance. The 80 compression is designed for women, seniors and juniors. The 90 compression is considered average and is used for the majority of recreational golfers. The 100 compression consists of a tighter, harder core than necessitates a high-swing speed by advanced golfers. 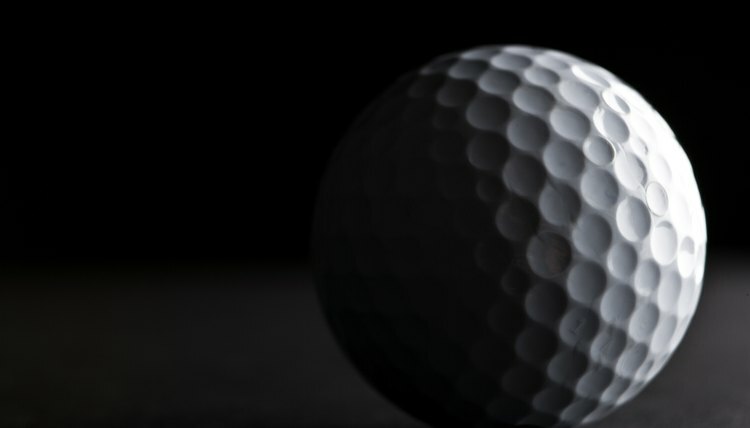 Since 1900, there have been more than 5,000 patents granted for golf balls. The impact of club to ball is just a fraction of a second, much quicker than the speed of sound. So, the sound of the ball occurs after you hit it. A rubber-like balata ball carries up to 15 yards less in cold weather, usually around 32 degrees F, than in warmer summertime temperatures. The number of dimples on a golf ball ranges from 400 to 1,000. A ball hit off the tee usually goes at speeds roughly at 160 miles per hour. The backspin of a tee is nearly 3,000 revolutions-per-minutes, three times the speed of a car's wheel. A wedge shot can spin at 10,000 revolutions, per minute. The United State Golf Association requires that a ball should not weigh more than 1.62 oz. The heavier the ball means that it is less resistance to wind and may fly farther. Golf balls are at least 1.68 inches in diameter. A smaller ball may also fly farther than a larger ball if weight is equal because the smaller ball is facing less wind resistance. Tim Bodamer is a freelance writer based in Seminole, Florida. He attended Edinboro Univerity of Pennsylvania where he studied journalism. He has 15 years of writing experience and specializes in sports, business and general interest topics. Which Golf Ball Is Best for My Swing? What Golf Ball Is Best for Me? What Is Golf Ball Compression?